WWTW 11 invites you to meet artists who have the write stuff  a Glencoe bookstore where the play's the thing, the novel ideas of Galesburg author Robert Hellenga and a statewide competition giving teenagers poetic license. 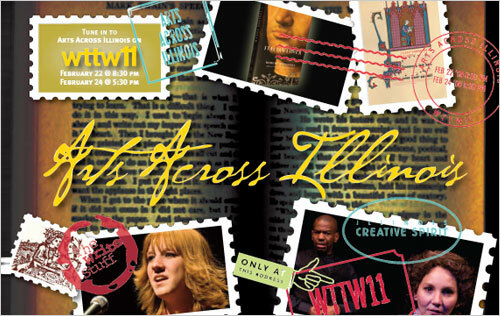 Join Phil Ponce as he finds out what makes all these Illinois artists word perfect on Arts Across Illinois, made possible by the Illinois Arts Council, on Friday, February 22nd @ 8:30pm and Sunday, February 24 @ 5:30pm. Traditionally poems would be recited and memorized, passed from poet to poet through the ages. It is only recently that poetry is something that one reads alone. But a national competition is trying to change that. Arts Across Illinois profiles Evanston teenagers competing in Poetry Out Loud. Best-selling author Robert Hellenga has spent most of his life in the Midwest. Arts Across Illinois visits him at Knox College in Galesburg to find out what role the Midwestern spirit plays in his fiction. Books literally come to life at a bookstore in suburban Glencoe, just north of Chicago. It's home to Writers' Theatre, whose latest production is keeping audiences on the edge of their seats. Chicago's Newberry Library is one of the nation's largest and most respected research libraries. Among its 1.5 millions books, there is a rich music collection. The Newberry Consort is an early music ensemble, devoted to performing works from the 13th-17th century, often drawing from the library's own priceless holdings.